New “no jab, no play” childcare laws introduced in two Australian states have prompted a controversial anti-vaccination group to create a “church” of its own that rejects vaccination, but is actually merely a business, according to local media reports. The Australian Vaccination Skeptics Network has set up the “Church of Conscious Living” as a religion that could help skip the vaccination, crucial to enroll in childcare under a New South Wales 2013 law, as well as Victoria’s proposed law set to start in 2016, The Age newspaper reported Wednesday. According to the new laws, children who are not fully immunized are unable to receive pre-school education – unless their parents declare they have a special medical, personal, philosophical or religious reason to refuse the vaccinations for their children. The same document is needed to get a tax benefit for families with children. 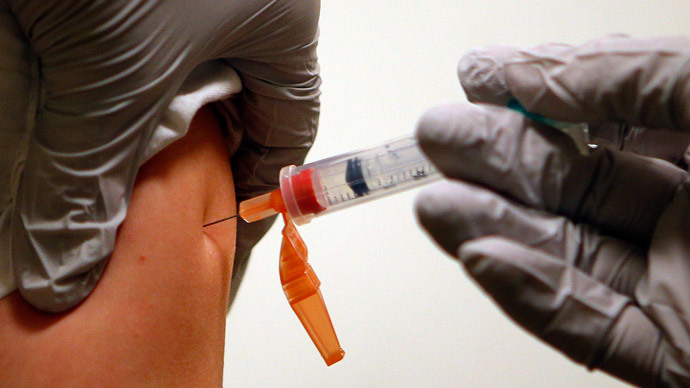 Commenting on the anti-vaccination church, a spokeswoman for the Australian Federal Department of Health told The Age newspaper that it would “closely look” at the organization, though outlining that vaccination is not compulsory. “Setting up a church will not alter the requirement for parents to discuss vaccination with a doctor and obtain a signed objection form,” she said. The Australian Vaccination Skeptics Association, formerly known as the Australian Vaccination Network, was renamed after an order by the NSW government, based on an inquiry that found the network was spreading misinformation. Both the network and the Church of Conscious Living both failed to respond to calls for comment, the newspaper said. Since 2008, eight Australian babies have died of whooping cough, a highly contagious bacterial disease with a high death rate among children, the Herald Sun newspaper reported. In 2013, California was hit by the largest whooping cough outbreak in 60 years – and it was blamed on parents who objected to the vaccination of their children. The anti-vaccination movement, or vaccine hysteria, has emerged with the vaccination technique itself. It irrationally links vaccines with such disorders as autism, Sudden Infant Death Syndrome (SIDS), or the covert spread of AIDS.